In this early twenty-first century, the preservation of the planet takes unprecedented centre stage in human history, mobilising individuals and organisations. 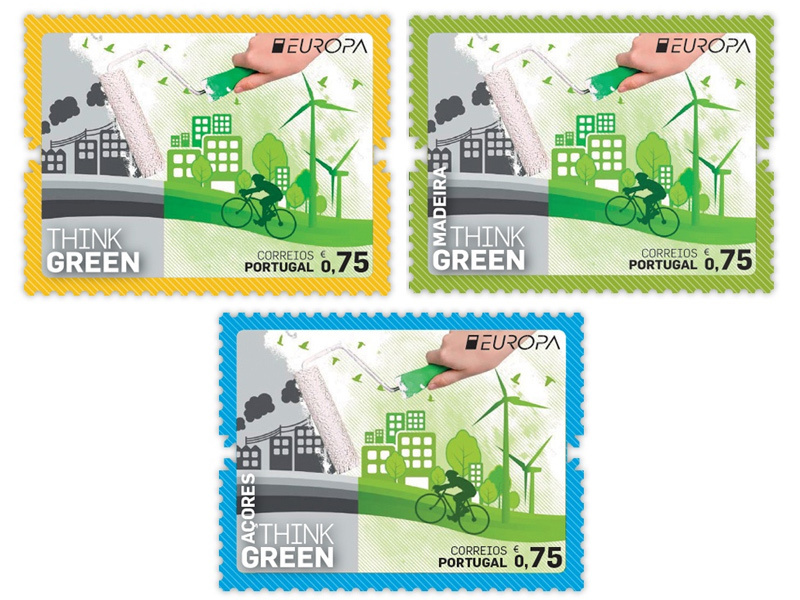 This is the case at PostEurop, which has adopted the Think Green challenge to celebrate the 60th anniversary of the first European joint issue. In 1956, the theme proposed was Europe — A Community of Interests and Goals. In 2016, the old continent has undergone profound changes, but kept its foundational concept intact, in the words of Botond Szebeny, Secretary-General of PostEurop. Ecology has also become a value shared by European governments and peoples. Actively involved in building a better world, Europe has also been the site of important world meetings about the Environment, such as the Stockholm Conference of 1972, a milestone in taking environmental awareness decisions on a global scale. Recently, in December 2015, representatives from 195 countries meeting in Paris at the Climate Summit, under the aegis of the UN, approved an international treaty that was considered historic, involving those nations in a collective effort to counter the effects of global warming. From this indisputably current theme, PostEurop chose to mark the 60th anniversary of the first European stamp issued with a joint design. In regular issues, there is a common topic, but each of the 52 operators that are part of the association freely develops their respective philatelic project. This year, in order to find the best artistic proposal, a competition was organised, resulting in 24 competing works, voted for in secret. The Cypriot operator was designated the winner, leaving the second place to Slovenia and the third place to Hungary. Doxia Sergidou, author of the piece chosen, wanted to demonstrate that “it is in our hands to create a greener planet”. She further specifies that the hand that appears in the top corner of the stamp represents the power that anyone has to actively replace the grey (the pollution) with the green colour which symbolises life and environmental hope, inspiration for a better world and the only way to ensure a harmonious existence to future generations. PostEurop brings together operators from 49 countries who, together, represent 2.1 million jobs and ensure daily postal services to 800 million people. Environmental sustainability has been part of its management strategies for a number of years now. In Portugal, Environmental Policy consists of a framework for the activity of CTT and has been the source of pioneering actions, the result of investment in products, processes and technological innovations. The company operates the largest national fleet of alternative vehicles, made up of 305 vehicles (10% of the total), it uses more than one hundred and fifty electric bicycles and has reduced its carbon footprint, with CO2 emissions that are lower today (by more than 40%) than they were in 2008. In the postal distribution plan, it has invested in adapting the means of transport to the different terrain of the three national territories: the archipelago of the Azores and of Madeira and the Mainland. 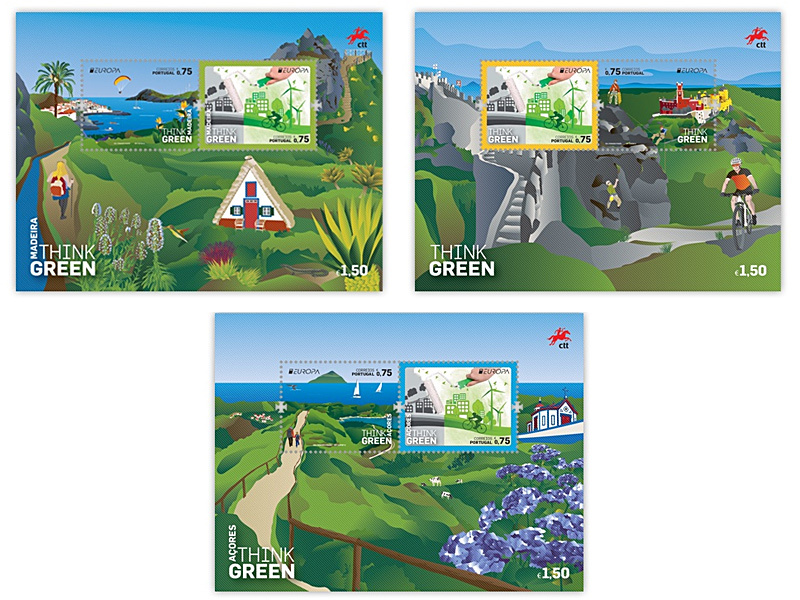 Three unique landscapes, defined by multiple natural resources, which CTT honours in the souvenir sheets and stamps of this issue, in witness of an ethical commitment to future generations.